Google dropped a bomb on us a few weeks ago when Google Places removed all 3rd party reviews. This affected many dealers (including mine) that had been focusing on only one site while not getting dealership reviews across multiple review sites. Many of us leverage the features and services of DealerRater.com. My self included. Due to these changes, I was curious to what was buzzing around the DealerRater offices. I thought I would ask. Jeff: Why aren’t my DealerRater reviews showing up on my Google Place page? Matthew: Google has revamped the appearance and layout of the Places page to allow for increased emphasis on Google User reviews. The Places page will display Google user review counts, star ratings and review content, which is then followed by third-party review counts like DealerRater. In addition, no third-party review snip-its now appear on Google Places. DealerRater reviews are still indexed on Google and your DealerRater star rating is still prominently seen on the first page of Google search results. 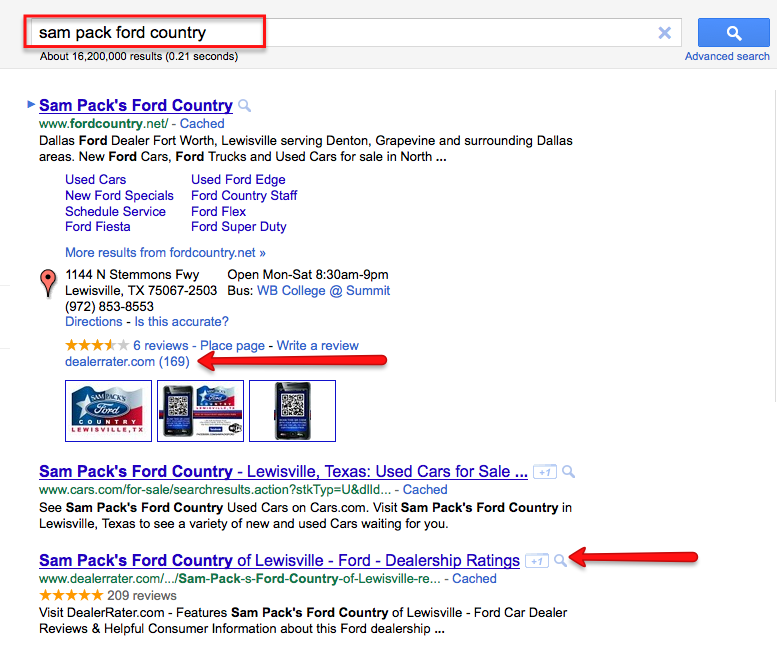 In addition, DealerRater reviews gain high organic search placement. Jeff: What is DealerRater doing to help dealers through this change? Matthew: Later this week DealerRater will be releasing a new product called DealerRater Push as a part of the DealerRater Certification package. DealerRater Push will automatically detect whether a reviewer has a Google Gmail account, and if so, in cases where the user is submitting a positive review, the final step in the DealerRater review submission process will be for that reviewer to also very quickly copy and paste their positive review and STAR rating to your Google Maps/Places page. Not only will DealerRater Push ensure that you generate numerous positive reviews on both DealerRater and on Google, but it will also make it such that those reviews will post immediately to your Google Maps/Places page (rather than having to wait the 4 to 6 weeks it has traditionally taken for Google to find and index your DealerRater review content). Jeff: With the recent changes to Google, should dealer focus their attention on Google over DealerRater? Matthew: Google is a great starting point when you’re looking to monitor what your customers are saying and hearing about you online; however, you also need a proven and comprehensive Online Reputation Management strategy in place to build, manage and leverage reviews. 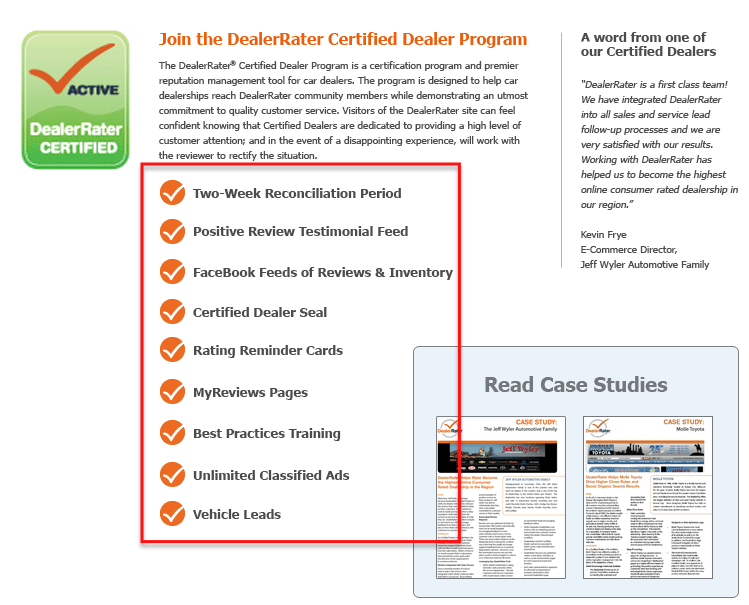 DealerRater’s Certified Dealer Program provides various point of sale tools (such as rating reminder cards) as well as best practices training to help position your dealership for a successful Online Reputation Management strategy. In fact, those dealerships who build positive reviews on DealerRater gain a competitive advantage because they can then leverage those positive reviews to persuade prospective buyers to visit their showroom as opposed to visiting another local dealer with a less favorable reputation. See image below. Where would you choose to shop? Jeff: What are the key differentiators of DealerRater’s Certified Dealer Program? DealerRater provides individual sales team or MyReviews pages. Various point-of-sale tools including rating reminder cards, window decals and table tents to encourage customers to write reviews. Dedicated Content Integrity and Support teams to quickly and directly answer your calls and ensure real, credible reviews. Matthew, thanks for taking the time to answer a few questions for the community. Many dealers/readers here on DealerRefresh are strong users of DealerRater. So as this interview might come across to some to be on the promotional side, I wanted to be sure dealers were aware and to help reiterate the additional features that DealerRater offers. As many here know, I’ve always been an advocate of DealerRater and the process it helps to establish at the dealership in order to help change the culture within dealership. Thanks again for your time. Sorry, I’m confused, one of whose indicators? This is awesome. I love how they create their strategies. DealerRater has created some of the best concepts in the industry. It is not just the service that they provide but it is the lessons that we learn that help us succeed with other websites such as google, yelp, edmunds, etc. I now read reviews every time I go to buy something. My contention is that any strategy focusing on either “one site” or “multiple review sites” is inherently flawed because it is unnecessarily too limiting as well as supportive of review sites which are structually damaging to business (auto dealerships as well as all other business models). Why not publish and mass-distribute your positive customer testimonials across the Internet via a network of 5,000 independent sites? Similarly, why not mass-distribute video (both testimonials and commercials) for the same purpose to the nearly 500 video sites out there? Saturate the first three pages of Google with your content and boost search-driven traffic by almost 100%. Bump bland, negative, or competitor content by replacing it with your happiest customers shouting from the rooftops your great story. Stop bleeding out profits from continually losing 80-90% of folks successfully motivated by your marketing to seach for you but who NEVER make it to your site. You can’t achieve this with 3rd-party review sites or even dealerrater.com, who may not promote your competitors on the same page as you (they ARE only a couple clicks away, though) but still soesn’t remove negatives. Most importantly, all your content is on one site – you cannot mass-distribute your good news across the World Wide Web. There is so much more I wrote but deleted it for length. However, when you’re in someone else’s house you should always mind your manners, as I will in yours. I will not post any contact info for your readership but I’d love to talk about this to you, Jeff. instead ask you to contact me through the e-mail addrss in my sign-in for this post. Tactful sales pitch Phillip. Nice job. So pouring your reviews out to “5000 review sites” with no authority is better than focusing your resources on sites with authority and quality traffic? Sorry but I would have to disagree. Your merely focused on SERP saturation and loosing sight of customer engagement and click path (how the customer gets to these review sights). Not saying it doesn’t have any value. I’ve seen the pitch before but its more “show” than results. Customer testimonial video – that could be a slightly different conversation. Thanks for the soft pitch though. Jeff, thanks for the kudos but I’d prefer you giving my product much closer scrutiny :-). Please understand there’s much more depth to this program than I could treat here without getting bogged down in people’s understandable imaginings of what it is we actually do. Our impact is far beyond “show,” I assure you. You may believe you’ve seen the “pitch” before but whatever it was it was not for anything resmbing what we do because we have yet to find anyone competing on our battleground. I guarantee you nobody does what we do. Furthermore, there’s no need to use scare quotes around the number of our partner sites. That’s a real number. Jeff, you’re correct that these sites in themselves are generic and have no industry authority, and I certainly didn’t mean to suggest our product as an alternative to DR, Edwards, or others like them in the particular ways they represent the auto industry and serve consumers. Instead, I was building on your lament about the shortcomings of relying upon one site to provide for reputation management needs, and I did so by pointing out the limitations of merely widening the scope to include a handful of others like them. While we cannot do much of what they do (and we don’t intend to) the fact still remains they also cannot do what we can do, and that cannot be so easily dismissed before comprehending completely the full impact of our branding model on dealership marketing goals. Remember, each googe result the client owns is one less distraction threatening to steal away the prospect who started out focusing on you but who never makes it to your site. SEO cannot solve this problem, whether for your site or industry sites like DR. Presumably DR and most dealers have SEO in place while still losing prospects who never make it to their site. I hope I don’t sound arrogant with this next statement, but I submit to you that the authority inherent in our model is the highest authority of all: that of the happy, satisfied customer whose positive testimonial is no longer stuck in a folder buried in a dealer managers’s desk or waiting patiently for visitors to that corner of your website so assigned to that occasional task – if they get there. We are backed by the authority of a happy consumer whose testimony is now actively engaged and multipled so that each review we launch is the online equivilent of Madison Square Garden full of screaming fans. We proliferate the same review across so many sites that along with the other content distributed similarly we are able to shape what the viewer sees when they search your dealership. Our snippets utilize “title expressions” (our in-house term, hence the scare quotes) taken from the customer’s own words in upper-case, so a viewer scanning the search results page sees positive, glowing sentiments strewn throughout the page. Consumers give more credibility to other consumers “just like them” (or so the subtextual thinking would have it) than they do to paid spokesmen. Sites with authority as I think you mean it are a modern high-tech variation of the same concept of the paid spokesman. Still, we don’t intend to be an alternative to much of what they do EXCEPT in obtaining the greatest value you can get from your legitimate consumer testimonials. So what are the benefits of our model which give it such exalted value? Eighty-one percent of consumers search a company with whom they might have interest in doing business. Use the Google ad word tool to measure the total monthly searches under your trading name(s) or URL, and compare to the total number of unique visits you get. Most firms find they get 10-20%. Losing 80-90% (or even half that) of prospects who started out interested in you but disappeared along the way is not only an illustration of burning leads before you even see them but also represents the ultimate neutralization of your marketing and advertising campaigns which got them to the point of googling you to begin with. THAT’s the bleed-out we staunch, except unlike Rambo cauteizing his own battlefield wounds with a red-hot knife our approach doesn’t hurt because we are also a branding tool and a reputation management tool. Each of these reviews is back-linked to the client site, which adds a significant and growing boost to their SEO. We normally are able to at least double the traffic from company search results, and often more. Jeff, I could go on here but I already have gotten into making points better covered in the tour my CEO would love to personally present to you online. He comes from the auto industry; our company used to design high-conversion (30% plus) websites for the dealerships and lenders until we accidentally stumbled onto this solution. We completely changed our business model to this product line once we grasped the ramifications. No insult intended but it seems you may be drawing some conclusions as to what we do and the limitations to dealer value you perceive. It’s reasonable to do given how little substance I am able to communicate in this format but you can’t fully grasp the power of this thing unless you’ve seen it up close. In this you are not alone; because what we do is so far outside wide-ranging previous business experience people constantly express to us after the presentation that when we first approached them they had no idea that what we were talking about would lead to what they had just seen. So, as a courtesy I want to offer you a challenge and a small wager (the fact I’m not a betting man ought to tell you something). You give my CEO 25-30 minutes for the presentation along with your active participation. Ask him all your questions and challenge him all you want. I advise you to allow another 15 minutes or so because your inevitable questions will likely cause us to go to 45 minutes (an hour is not unusual once our prospective client becomes better acquainted with us). BTW, I’ve never seen anyone dismiss our product after the presentation and bail out with no further interest. There is always discussion. If you hold to your original position and dismiss our product’s value to the auto industry then I’ll send you a $10 Starbuck’s gift card as “consolation” for lost time. Of course, it’s not much nor is it intended to be so to keep the focus on what’s really important. I mean this as a friendly wager only; I’m playing for higher stakes such things and don’t want to be distracted by that which has little value. OTOH, if you are impressed by Mr. Coleman’s brainchild and express that via an agreement with Younger’s and/or an alternative but similar arrangement then I’ll quite naturally “forgive” the gift card. Who knows, contrary to your initial take the tour experience might make great fodder for a future blog post. If appropriate or desirable you even may invite Alex Snyder, Joe Pistell or anyone else you choose. We operate out of Vancouver WA (we draw our engineering genius from the rich talent pools emanating from Microsoft & HP) so the earliest we can meet with you is 11:00 a.m. EDT (8:00 a.m. PDT) M-F, but conversely we can stay late (8 p.m. EDT) with you as well. To take me up on my offer you may contact me at the e-mail in my post sign-up here; again, I’ll again refrain from posting my contact information on your blog. Besides, it’ll have so much more power behind it if you eventually come to recommend your readership to examine us for themselves. Google controls the internet, like reynolds and reynolds controls our accounting. Do we need Dealerrater, or just utilize what Google wants us to use, like our relationship with reynolds? I don’t see what you are getting at with the parallel between Reynolds accounting, Google and DealerRater. Are you saying that it is an either/or situation? Can you clarify your comment or question? I admit that I can be slow, but I am just not following you. One thing I can tell you for sure is that the DealerRater team doesn’t train an either/or strategy, the new PUSH feature serves as evidence to that. The principles we teach are much more holistic in terms of ORM. You need to be aware of everything so that you can actively leverage the things that are marketable to improve lead to show and closing ratios.